The Toshiba HDR5010 is one of the more conventional-looking PVRs in recent months. While rivals tease with wacky designs, this Toshiba is slim and staid. It'll easily slip into a standard equipment rack, or stand atop other slice of AV gear. A clear channel display and bright blue/red power button decorate the fascia. The HDR5010 sports two Freeview HD tuners, allowing two HD channels to be recorded at once to its chunky 500GB drive. You don't have to look too closely to spot operational similarities to the TVonics DTR-Z500HD. The HDR5010 similarly has two HDMI inputs, allowing it to function as a source switcher. You choose which feed to route through the unit by selecting the relevant HDMI input button on the remote. Backside connectivity includes a Scart, a digital audio output, (non-functioning) Ethernet LAN and two USB ports. Neither USB offers media playback, but they will let you view your JPEG snaps. The HDR5010 is a doddle to use, always a key virtue for a digital recorder. When connected for the first time it makes short shrift of the channel tuning procedure and is soon ready to play. The live pause buffer varies from 1, 2 and 4 hours. For most of us, a couple of hours will more than suffice, although the hard drive is so big it's no problem to set the cache on maximum. There's also picture-in-picture functionality. The HDR5010's user interface is rather neat, overlaying your recorded stash in a translucent window. There're plenty of library management options: you can filter recordings by file size or age, and if you want to prevent accidental (or malicious!) deletions you can lock them down and throw away the key. Hopping between Freeview's Radio and TV functionality is made all the easier through dedicated keys. Thoughtfully, Toshiba offers a screensaver for plasma owners that's designed to help prevent possible image retention of station logos. There are no surprises when it comes to basic functionality. Recordings can be made via the TV guide or live transmissions, and you'll get prompts if you inadvertently opt for a standard-definition show when there's a more beguiling HD version elsewhere. You can also Series Link whatever you want, while Playback can be started before a recording has even finished. Picture quality is very good, mirroring the fidelity of original transmissions. No prizes for surmising that this PVR looks its best with hi-def fare. Detail drips from the two BBC channels in particular. Once viewed, TV shows that hold extra interest can be archived to another recorder, albeit only in standard-def form; just lace up the HDR5010 to your archiving machine by Scar and hit Play/Record. There's no dubbing in HD. Bonus niceties include an audio tweak that enables you to alter the delay variable between 0ms and 250ms (in 10ms increments), and Dynamic Range Control. The former may be useful if you have an older flatpanel with latency/sync issues, however we'd advise leaving DRC well alone (particularly if you're routing the box into a home cinema system), as it just robs any sparkle from the audio track. Operating noise is exceptionally low, and the HDD itself is well behaved, running cool even after prolonged usage. 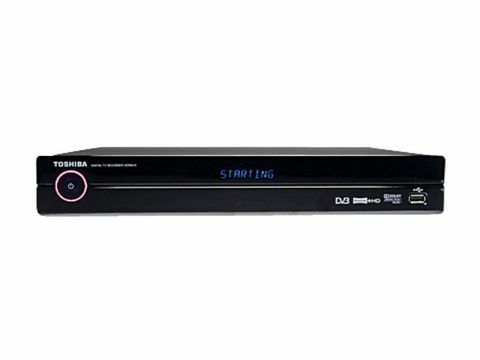 The HDR5010 is a well-built, likeable Freeview+HD recorder that's highly suitable for use in home cinema systems. A large hard drive, convenience features and a polite disposition make it a great option.